Start by assessing the scallops at the fish store. I usually inspect every one just to make sure that they're all in perfect shape, i.e. not torn, and fresh with a sweet ocean smell. The next step is to remove the side mussel that connects the scallop to its shell; its not hard to miss;just pull it off with your fingers. Keep the shells to serve the ceviche in. Using a sharp knife, slice the scallops in half lengthwise into discs; the thinner they are, the faster they'll "cook". Put the scallops in a glass bowl and season with a fair amount of salt and pepper. Put the citrus juices, zest, and sugar in a blender and give it a whirl to combine. Add the olive oil and blend again to emulsify. Pour the marinade over the scallops; there should be enough juice to allow the scallops to float freely. Cover and refrigerate for 2 to 3 hours, until the scallops are opaque, i.e. cooked from the acid in the fruit. In a separate bowl, combine the cantaloupe, mint, and chili; season with salt and pepper and toss gently to combine. 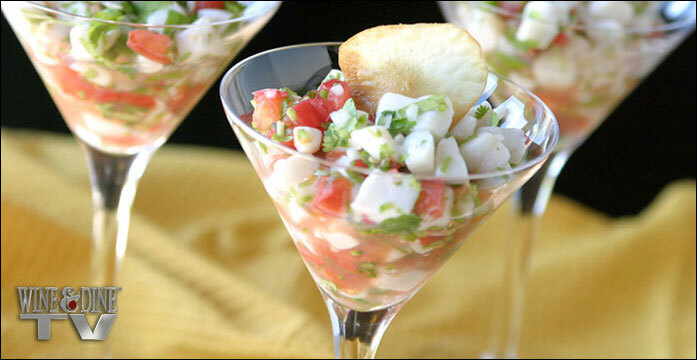 To serve: Spoon the scallop ceviche into the shells with a little bit of the citrus juice, and top with a spoonful of the cantaloupe salad. Garnish each serving with some fresh mint.